How can the Pacific Northwest move Toward Renewable Energy and Ecosystem Services (TREES) using poplar trees? A diverse group came together at the TREES Summit on April 25th to explore potential answers to this question. 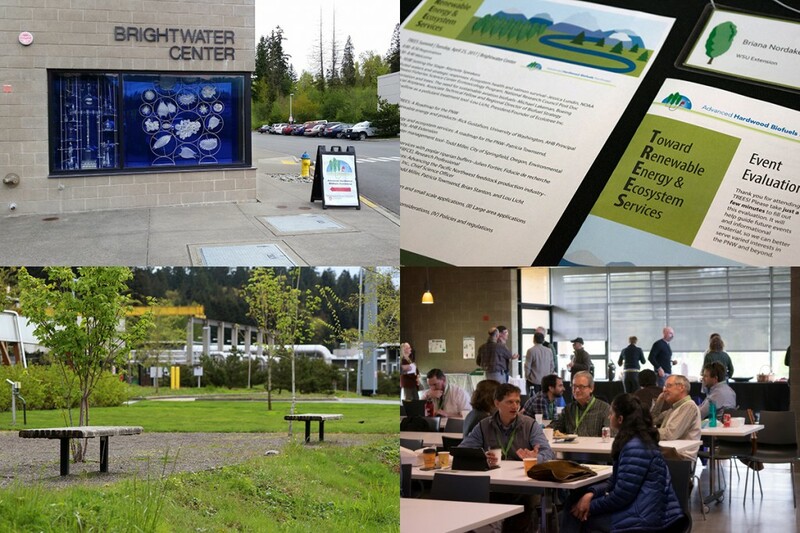 Stakeholders from around the Pacific Northwest came to the Brightwater Center to discuss how we can use TREES for ecosystem services and biofuels. Over fifty people were in attendance, including researchers, government employees, business professionals, and non-profit representatives hailing from WA, OR, ID, British Columbia, and Québec. 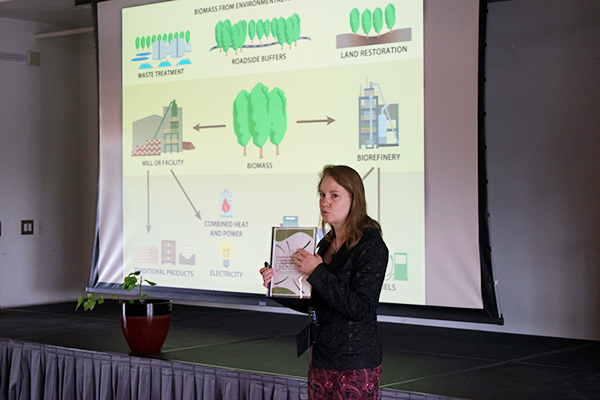 Some participants attended the National Poplar/Willow Forum in April 2016, but for many the TREES Summit was a first introduction to poplar’s potential to serve as both a bioenergy feedstock and environmental clean-up tool. On the left, attendees listen to keynote presentations. On the right, Jessica Lundin from NOAA and Bob Simmons from WSU Extension chat during the lunch break. The day kicked off with a sad reality about one of the Pacific Northwest’s greatest natural treasures. Salmon populations continue to struggle despite huge investments into their protection. Jessica Lundin, a researcher with NOAA’s Ecotoxicology Program, gave a sobering account of stormwater runoff’s influence on salmon in the Puget Sound region. She recounted a study that put salmon in a tank of runoff water collected from Highway 520 in Seattle. All the fish died within a few hours. But, when the stormwater was first filtered through sand and biological material, the salmon were fine. Some of the researchers at the summit wondered if poplar trees could create a similarly effective filter. Using poplars for environmental filtration is not unprecedented. Trees are natural systems that pump water and carbon, and poplar trees capture excess nutrients and contaminants as they do so. Lou Licht, president of Ecolotree Inc., shared his experiences with harnessing the power of poplar to provide economical treatment of pollution. For example, Ecolotree Inc. has planted stands of poplars over landfills to drastically reduce the costs of site clean up. Lou Licht, President and Founder of Ecolotree Inc. giving a spirted presentation on using poplar trees to clean up landfill sites. Todd Miller shared how poplars are being used by the Metropolitan Wastewater Management Commission to filter re-use water and process biosolids for Eugene and Springfield, OR. The poplars are harvested and sold to a variety of companies in the area. TREES attendees also saw evidence that poplar plantings can restore riparian habitats and create healthy ecosystems. Julien Fortier, a researcher from Eastern Townships Forest Research Trust, discussed the environmental benefits of poplar buffers around agricultural land in Québec, Canada. Julien Fortier from Eastern Townships Forest Research Trust shared some of the results of using poplar trees as riparian buffers. The left photograph shows the outside view of the buffer and the right photograph shows the stream inside the buffer. 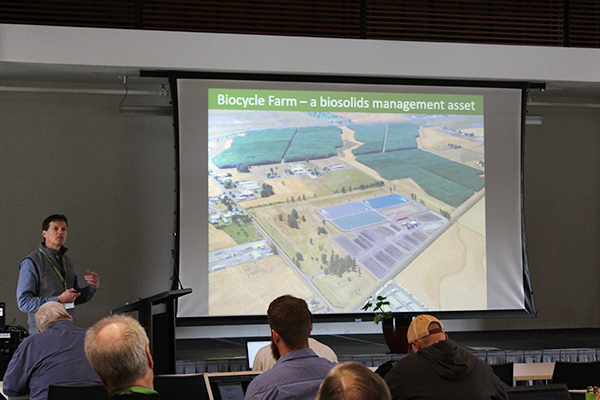 Todd Miller talked about the Biocycle Farm managed by the Metropolitan Wastewater Management Commission in Oregon, which helps the wastewater treatment facility process biosolids and wastewater effluent. In addition to providing environmental clean-up services, poplars can quickly produce large quantities of biomass, which makes it a good candidate for suppling a biofuels industry. Michael Lakeman of Boeing Commercial Airlines (Regional Director of Biofuel Strategy) discussed how biofuels are a key component of the aviation industry’s proactive plan to reduce emissions while maintaining growth. Those biofuels must come from biomass that is 1.) scalable, 2.) affordable, and 3.) sustainable. Could fast growing, short-rotation poplars provide that biomass? Michael Lakeman spoke about the airline industry’s commitment to sustainable air transportation and the role biofuels play in reaching that goal. 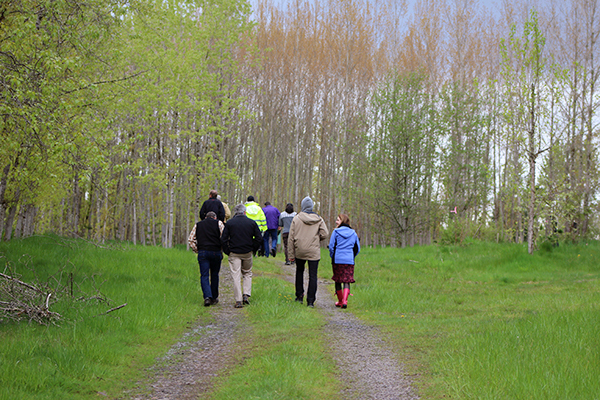 Participants learned about Advanced Hardwood Biofuels Northwest’s vision of a sustainable poplar-based industry that provides cost-competitive biofuels and bioproducts by harnessing poplar’s ecosystem services. However, moving toward renewable energy and ecosystem services will require that ecosystem services translate to realized cost savings or profit generation for growers and investors. 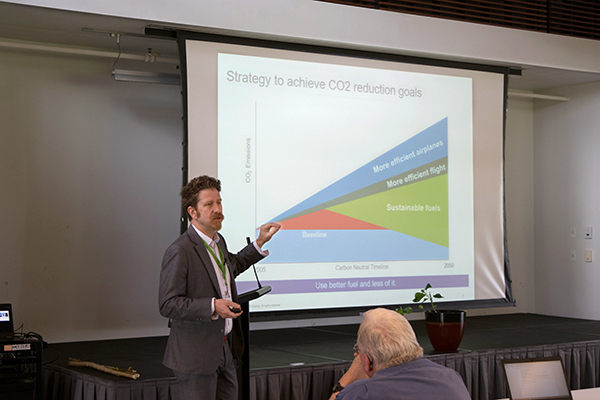 Brian Stanton, of GreenWood Resources, presented a case study of a company in the southeastern US, GreenTrees, with a business model around generating carbon credits by growing poplar trees to facilitate afforestation. A poplar cooperative of many moderate and small poplar tree farmers could perhaps generate the scale necessary to make a carbon market and bioeconomy accessible in the Pacific Northwest. Patricia Townsend presented the Poplar and Willow Roadmap, an overview of how these crops can be used in the PNW. 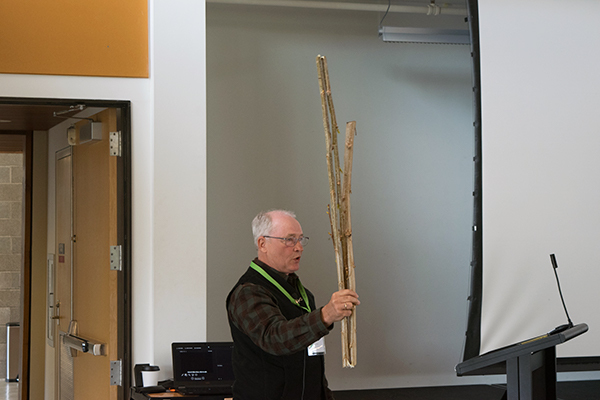 Wanting to take advantage of varied perspectives and expertise of TREES attendees, the afternoon was spent in small, themed workshops exploring the ways poplars can be used in the PNW. In addition to generating new ideas for the “Roadmap for Poplar and Willow to Provide Environmental Services and Produce Renewable Fuels” (contact patricia.townsend@wsu.edu for more information), the workshops provided participants with a more nuanced understanding of the needs and views of different interest groups. For example, non-farmers learned about negative perceptions of buffers within in the farming community. Those unfamiliar with water quality monitoring learned that if geese land in your study area, it can really skew your test results (goose droppings are potent!). In the afternoon, TREES participants broke out into small groups to discuss specific facets of using poplars for ecosystem services and biofuels, such as policy adoption and economic sustainability. The TREES Summit led to new connections and reestablished previous relationships. Although attendees are doubtful that growing poplars is a lucrative endeavor today, they were impressed by the breadth of innovative ways to use poplar for ecosystem services. Post-event evaluations indicate that a good time was had by all, with thoughtful company, a beautiful facility, excellent food, and a pleasant field tour to a former landfill turned poplar plantation. The Summit concluded with a field trip to a nearby landfill that uses poplars for waste management.